It starts with starting over, and that’s the worst part. I haven’t played No Man’s Sky ($60 on Humble, on sale for $30 this week) in quite a while now, and memory is fleeting. I tried loading up my latest save and...nothing. A generic planet, some garbage in my inventory, no handle on the controls, and no idea what to do next. So I jettisoned that poor explorer into space and started fresh. A lot has changed in the massive, free Next update. A lot hasn’t. 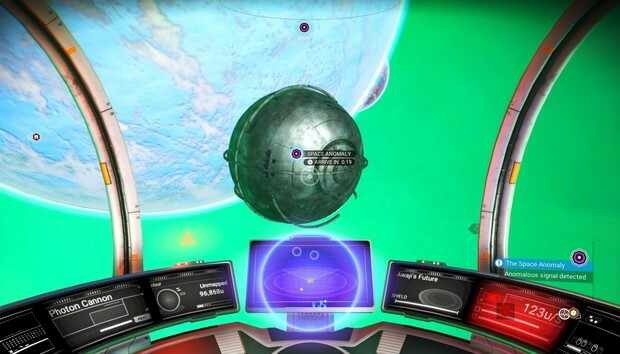 The opening hours of No Man’s Sky: Next are still mostly flailing about, shooting laser beams at dozens of rocks that all kind of look the same on dozens of planets that also kind of look the same. It’s a great game to play while doing something else—running Netflix on a second monitor, for instance. But there’s a bit more story to the space-spanning exploration now, and a lot more options. 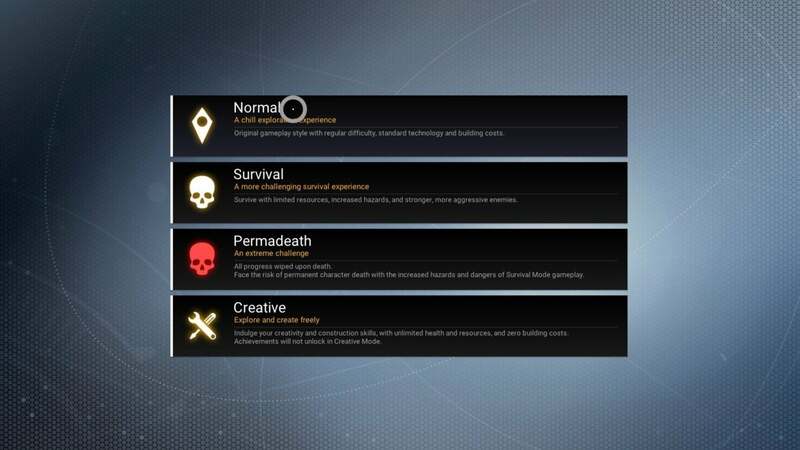 Adding difficulty levels is the best decision No Man’s Sky made. I mention it early because I think it might lure in some of the people who bounced off the first time. 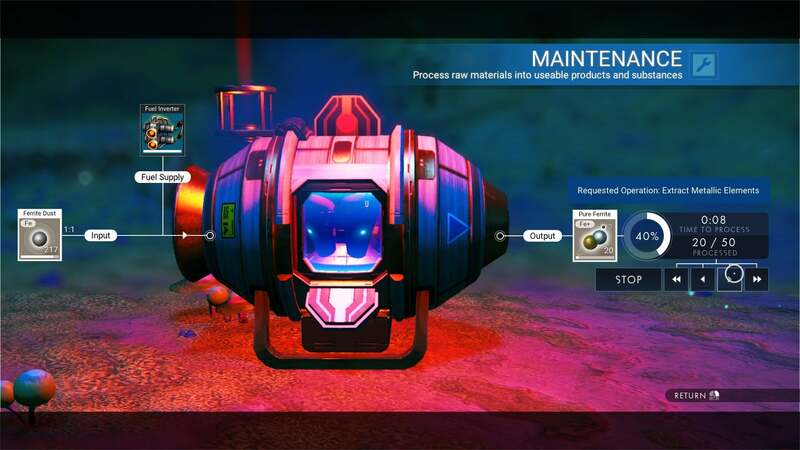 Arriving about six months after the initial release, Creative Mode ditched all the grinding, the resource collection and management, and let you focus on exploration and base-building. If you just want to casually tool around the universe, build some bases, and look at bear-dinosaur-bird creatures, choose Creative. I can’t emphasize it enough. Not that it’s without problems. Like any low-risk game mode, motivation becomes an intrinsic thing. Stripped of its various timers, the repetition sets in. Take off, land, look around, take off, land, look around. And there’s still not much to see. That’s, I think, No Man’s Sky’s biggest failing. Even all these years later, the limits of its procedurally generated universe are still so abundantly clear. 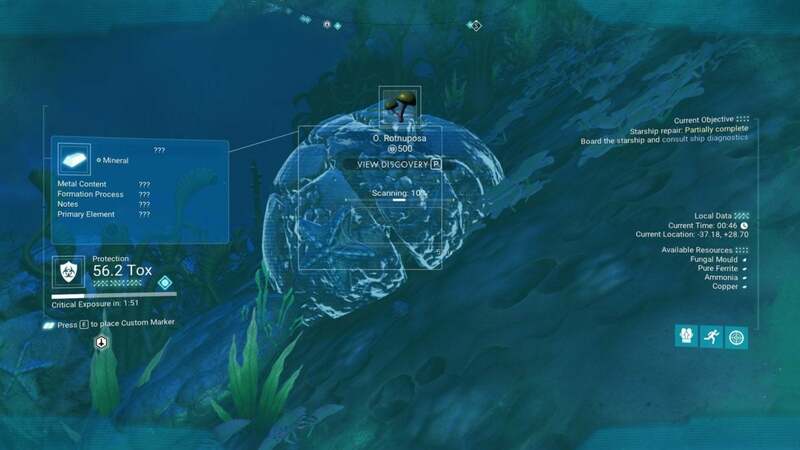 Within three hours I’d visited five planets and seen the same tentacle-plant on four of them, named differently each time but quite clearly the same art asset. Ditto for the weird ground-cover mushrooms on every semi-barren planet. The randomly populated buildings are even worse, which is strange given the whole base-building aspect. You’d think No Man’s Sky would scatter some pre-generated bases or whatever across the planet—but no. All I’ve found so far are the same pseudo-industrial structures from before, usually with one borderline-useless point of interest inside. Loot, and move on. I wouldn’t say it’s disappointing, or even surprising—not by now, at least. If you’re still somehow hoping for that “Wow” moment though, exploring this “limitless” universe, I don’t think you’ll find it. A couple of the planets are prettier than others, and there are still some strange and delightful oddities to uncover, but it very much feels like returning to No Man’s Sky in that respect. It’s the player’s end that’s changed. First of all, there’s multiplayer now. That’s enough to make even the most banal game a better time, and while I haven’t tested it yet I’m sure it’s a significant improvement for No Man’s Sky and delivers on a long-awaited promise. There’s also a third-person view. That’s top-layer though. It feels like everything has been rebuilt. Crafting, for instance. No Man’s Sky at launch was the story of how one fateful space explorer gathered the same dozen minerals over and over again, combined them in new-but-still-boring ways, and gear popped out. There are significantly more options now, with the Portable Refinery a key addition to your new home. There you’ll turn your mined Ferrite Dust into Pure Ferrite, or transform Copper into Chromatic Metal. And there’s also a lot more to do with the materials you’ve collected. 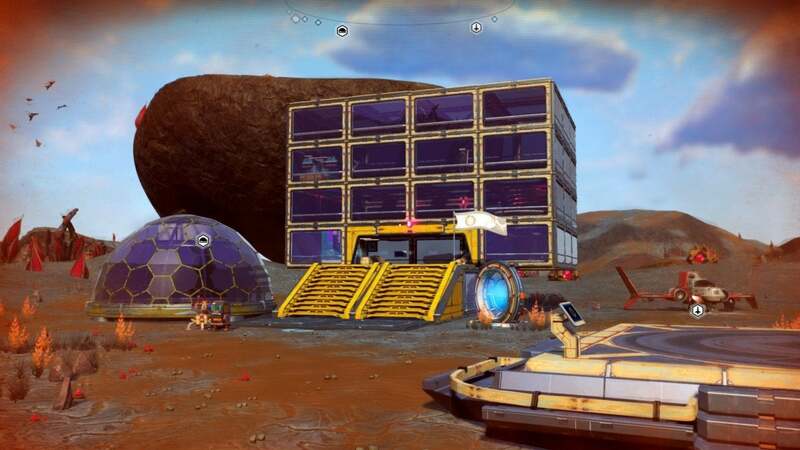 Base building has been in No Man’s Sky for quite a while now, but the Next update lets you basically use the tools for whatever you’d like. Not that you’ll need that flexibility at the beginning—there are a lot of four-walls-and-a-roof wooden structures in your immediate future. Pop into Creative Mode though and it’s impressive what you can build. There’s menu after menu after menu of items to go through, each ready to be recolored and placed in your new home. Rooms, decorations, it’s all there. There’s plenty of utility items too, which will be great news for those who haven’t gone back since launch: Save points, homing beacons, health regenerators, teleporters that let you fast travel base-to-base or even just base-to-that-cliff-you-liked-a-lot. Me? In the two years since No Man’s Sky launched, I’d had quite enough of base-building I think. Those with the motivation to build their own little house on the Acid-Rain Prairie should have a good time with it though. It’s going to require that sort of sandbox-centric personality. Even with the overhauls from 2017’s Atlas Rises update, No Man’s Sky is still a game you play for the promise of exploration, not the story. The authored content is better now than the old “Reach the center of the galaxy so you can realize it’s all meaningless and start over again!” story, but nothing about No Man’s Sky was designed to support a Mass Effect style space opera. 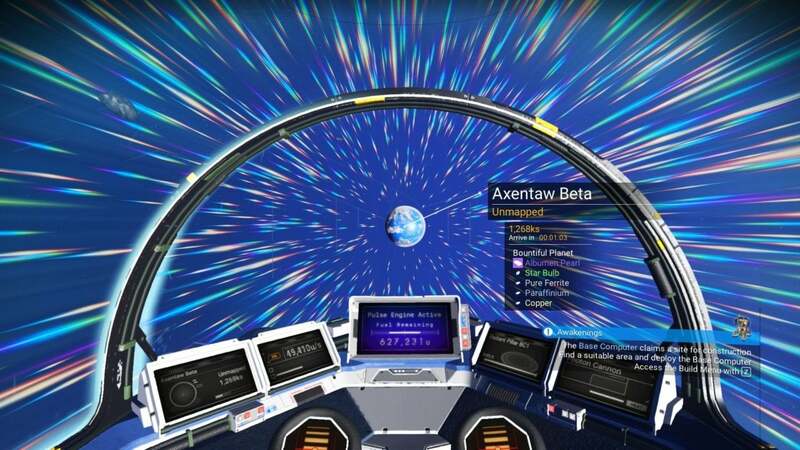 At best, it’s an excuse to keep you moving planet to planet, from blueprint to blueprint as you slowly unlock No Man’s Sky’s tools. Maybe that’s enough though. I don’t know. Is this the game people were hyped about in 2016? It feels closer, at least—much closer. If you bought it and it’s been languishing in your Steam account ever since, I think Next is a great excuse to go back, give it a second shot, and see the progress that’s been made. Regardless, it’s proof of the power of the new games-as-a-service mindset. A decade ago, No Man’s Sky ($60 on Humble, on sale for $30 this week) would’ve flopped and...that’s it. Forever a bad game. In 2018, though? It’s more of a cautionary tale, about a studio that let its ambitions get ahead of its capabilities—but one with a happy (or at least happier) ending.